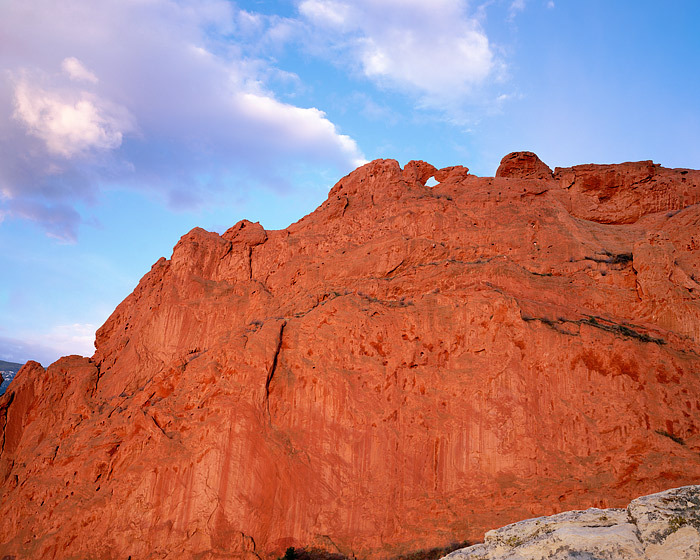 Garden of the Gods in Colorado Springs features fascinating red rock formations. One of the more well known formations in Garden of the Gods is the Kissing Camel formation. On this brilliant morning, clouds skirt overhead just before sunrise. The combination of the sun rising on the eastern horizon and the clouds over Kissing Camels caused for a unique lighting oppurtunity. The illuminated clouds began to act as a large diffuser of light and the red rock formation began to take on a pre dawn glow that would not have been present if not for the clouds floating overhead. I managed to expose two sheets of film before the glow dissipated. Photo © copyright by Thomas Mangan.